This year at The Great Notts Show we are really looking forward to our Kitchen Demos, we have loads of really different chefs bringing their unique style to the table…. be it a foldable table in a marquee. As you can imagine cooking in a Marquee with a very basic kitchen set up can bring all sorts of disasters, fires and downright scary outcomes. 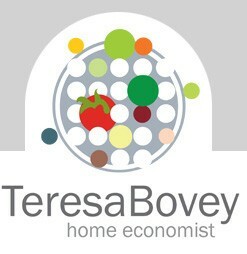 But that’s all the fun of it, Teresa Bovey a professional home economist from Nottingham shared some of her experiences with us and what she will be cooking at this years show. 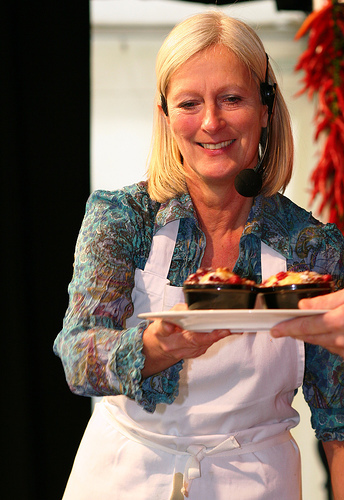 This year Teresa will be making a selection of quick seasonal starters and dessert ideas. All of the dishes are easy summertime recipes with lots of hints and tips showcasing good quality produce to demonstrate that cooking does not have to be a chore or be complicated. She makes a lot of promises for her demos and she follows them through, she shows us how cooking can be simplified and still healthy and delicious. Teresa will be making 4 recipes in her 40 minute demo, that alone is a very impressive promise, but we have no doubt she will manage it! Having worked in the Kitchen Demo World for over 10 years she is more than aware of all the different things that can go wrong, unsurprisingly A LOT can go wrong. ‘Chefs do not always turn up, food flambes when it shouldn’t, the gas on a hotplate runs out half way through a demo, equipment breaks, chocolate seizes, cream curdles under the bright lights, food freezes in the marquee overnight. It’s a live show, expect the unexpected and be prepared.’ We will Teresa, we will. Have you ever seen one of Teresa’s Demos? What dish are you looking forward to learning about? Let us know in the comments or on any of the social media below.